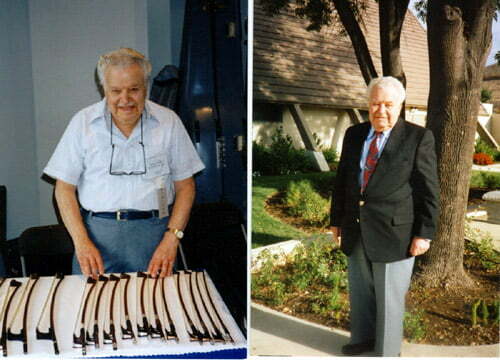 On May 23, 1999, the music world lost one of its innovators and a contributor to the Luthier profession. Samuel Kolstein was born, May 26, 1915 to Russian Jewish immigrant parents, Abraham and Rose Kolstein, in the lower East Side of Manhattan. In his early years Sam was recognized for both his musical abilities and engineering skills. He was one of the select high school students to be accepted to the elite Brooklyn Poly Tech Engineering High School. While developing his engineering skills, Sam nurtured his love of music by becoming adept in piano performance and composition. Upon his graduation from Poly Tech High School he was accepted to Juilliard as a piano major. As was the practice at Juillard, Sam was required to choose a secondary string instrument. The bass was his choice and Frederick Zimmermann was his chosen professor. Mr. Zimmermann recognized and nurtured the talents he found in young Kolstein. Sam progressed and soon found that his love for the bass had superseded his primary instrument, piano. Not letting go of either instrument Sam performed classically and jazz on the bass in the National Symphony and many other orchestras while continuing to play piano and accordion in big bands, the club date field, and jazz groups. During World War II, Sam was accepted into Special Services in the United States Army where his duties were to perform on all three instruments and compose numerous pieces for use in the military. Sam also composed several symphonies. Several years prior to enlisting in the military, his entry into the world of bow and instrument making came quite accidentally. His only bow was broken in an accident, and when told by current repairmen that it was unrepairable, he repaired it. Once again, Fred Zimmermann recognized the potential talent and gave Sam a Basin Bass that was literally in pieces. After months of working in his apartment with the tolerance of his greatest supportive force, his wife Fran, he completed the bass and returned it to Fred as a gift. Fred was impressed with the fine restorative level of work and gave the bass back to Sam as a gift. This was the beginning of the Kolstein Shop in the early 1940’s. Fred channeled all his work as well as his student’s work and colleagues to Sam. The next years saw Sam’s career grow. Much of his greatness was self taught. He was a man who saw insurmountable tasks that most would walk away from and he would say, “why not”. His ingenuity to design methods of repair and techniques of making bows and instruments were awe inspiring. Sam started his servicing of the “who’s who” in his own shop originally located at 56th Street and 6th Avenue in mid-town Manhattan and began a relationship with the famous Rembrandt Wurlitzer Establishment as the chief bow restoration expert. Upon leaving Manhattan in 1958, he relocated his shop to his home on Long Island and developed a solid nitch as a leading bow maker, restorer, and maker of basses. In 1971, his son Barrie Kolstein formally joined him in the shop. Sam’s dedication to the String Quartet and bows went far beyond just making and restoration. His inquisitive mind developed needed products from rosin to maintenance cleaning kits, to air freight touring cases made of state-of-the-art materials. He was not only a luthier, but engineer, chemist, and an extremely fine businessman. Sam had a hard exterior but one that was soft within. He recognized talent and was always there financially and emotionally for his clients. He considered his business a family business and clients were family to be treated as such. From the viewpoint of his cliental, Sam was a man that had a heart and soul dedicated to art and his clients. Status, position, appearance, and money held no charms for him. Many were the times that he fixed instruments for little or nothing, loaned and gave money, and provided a home for musicians in need. His home and his boat, the floating “Casa Kolstein”, as well as his kitchen were always open to those in need. Whoever came into contact with Sam had their lives touched by him and carried his presence creatively and emotionally with them. The creative genius of Sam Kolstein is evident in his bows — works of art used throughout the world by artists ranging from the late Sir Yehudi Menhuin to the finest cellists and bassists. There are very few orchestras that will not have numerous Kolstein bows being utilized by players as a constant factor in their playing careers. He was a prolific maker, but one that treated each work as his most important artistic achievement. He was a perfectionist in his work, but one that admired the beauty of handwork that was less than perfect. Sam had a brilliant mind. He had a curiosity and creativity that allowed him to see things that others would never see — to see the potential and to adopt them to his creative vision. When he needed machinery to do special things in his work, he designed it. He was always drawing designs of his ideas. He created a multitude of uniquely designed products with ideas coming from common observations of the world about him. From the unusual combination of the engineer and artist he was able to build an international business and a reputation built upon dedication and integrity. On a personal level, Sam had many diverse interests. Photography was one. He introduced his children to the magic of watching an image emerge in the darkroom. Sam was a pilot of the famed Piper Cub aircrafts. He was a natural athlete and a marathon swimmer – teaching all of his children how to swim. His greatest interest was boating. He loved being on the water. He served as Commodore of the Merrick Yacht Club and was a licensed navigational instructor for the United States Power Squadron. He was an avid fisherman and loved this pastime almost as much as his vocation. The music world has lost a wonderful man who displayed greatness in all that he accomplished. So many people become “Jacks of all trades, but masters of none”. Sam was a master at all that he touched. A great father, husband, musician and of course luthier, Sam has left a great legacy behind. We will miss you Sam and thank you for all you accomplished.